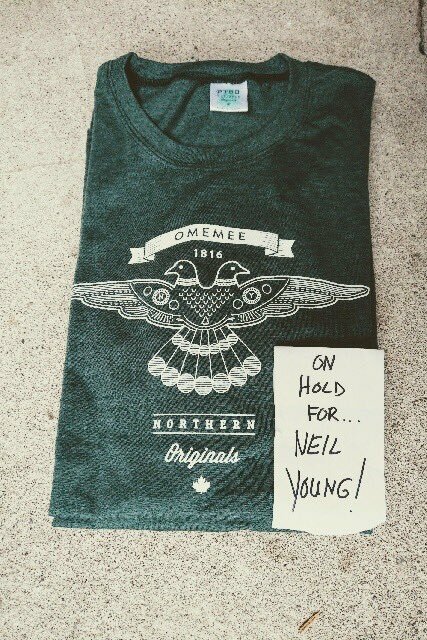 Mike Watt, owner of PTBO Northern Originals, a heritage-based clothing brand focused on local pride in Peterborough and the Kawarthas, was ecstatic when a member of Neil Young's crew dropped in to purchase his Omemee shirt on Friday (December 1st). "An assistant came in and grabbed them for Neil and Daryl [Hannah, his partner] on Friday," Watt tells PTBOCanada of his T-shirt line, which is available online and at his store Flavour Fashion in downtown Peterborough. "We actually hid an 'N Y' in the design—his initials—as a tribute to him," Watt tells PTBOCanada. Young may not have worn the Tee for his special concert Friday night in his home town of Omemee, but it was a cool moment the entrepreneur Watt won't soon forget. "I have to be honest—when we developed the design for the shirt we always hoped to get one to Neil," he says. "We're huge fans and want to pay tribute in some small way. This was special." 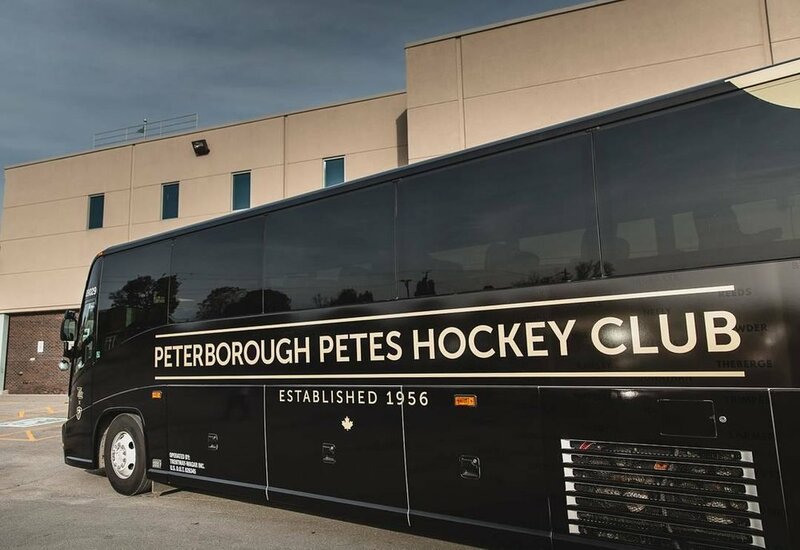 The Peterborough Petes—in partnership with Coach Canada, Northern Original Design and East Side Mario’s (Lansdowne)—are excited to officially unveil their newly designed team bus on Friday, November 10th. Fans and media will hear from representatives of the Peterborough Petes, Northern Original Design and East Side Mario’s (Lansdowne). East Side Mario’s (Lansdowne), the official sponsor of the team bus, will be providing coupons for all fans in attendance, and will also provide delicious finger foods. As well, all Petes gear at Flavour Fashion will be discounted for fans in attendance at Friday’s unveiling. In an exciting and innovative collaboration between the Peterborough Petes and iconic local apparel brand PTBO Northern Originals, a highly anticipated Game Day Collection apparel line will go on sale exclusively at Flavour Fashion in downtown Peterborough this Thursday (November 17th). The Game Day Collection—T-shirts, hats, crewneck sweaters and hoodies—incorporate four unique logos that represent the past, present, and future of Petes hockey, while providing a fresh look that compliments the style of today’s generation. There are several opening weekend specials to this fashion line, including a free PTBO Northern Originals puck with the purchase of any Game Day Collection item. In addition to the full apparel line, Flavour will be offering an extremely limited run of a specially designed hat, hoodie, crewneck and T-shirt this weekend. Head to Flavour Thursday anytime after 10 a.m. to get your Game Day Collection gear, and then wear it to the Petes game Thursday night against the Kitchener Rangers! New release as part of our 5th Anniversary! Peterborough Fashion Week is this week, and it includes a Never Too Old To Strutt show at Princess Gardens at 2 pm on September 24th featuring a group of models aged 65 and over. The show pays respect to the vibrancy, wisdom, grace and beauty of our elders. In a society where youth is worshipped, PFW want to "shed light and bring to the surface the divine beauty of aging gracefully, with integrity, strength and confidence." We reported back in June that downtown clothing store Skirt was temporarily closed. They indicated on the front door that they would be reopening August 15th, but that date has long come and gone. Now the Skirt logo sign has been removed and the store is looking sadly vacant. Their phone lines are no longer working either. Anyone know its status or what is going in here now?